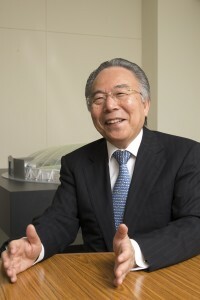 Takaaki Abe, CEO Granpa Co.
After a career in banking, Japanese entrepreneur Takaaki Abe entered a second line of business in his early sixties. He had witnessed firsthand the financial struggles faced by farmers. However, on visits abroad he had visited profitable agricultural enterprises which prompted him to consider fresh options for Japan. Knowing that about one-third of Japan’s farmers are over 65 and that the number of farmers is decreasing significantly, Abe was concerned. Japan produces less than 40% of its food supply which is far below other developed nations. Meanwhile, unutilized farmland is increasing. Into this vacuum competition from cheaper imported produce is stiff. In addition, younger people don’t seem interested in the agricultural careers of their grandparents. Those factors led Abe to form Granpa Co and develop a dome factory farming system in 2004. Now in his seventies and still leading the company as its CEO, Abe continues to promote the system from his Yokohama base. He believes that dome farming is part of the answer to not only Japan’s agricultural problems, but also the various challenges such as climate change and food safety facing agriculture globally. 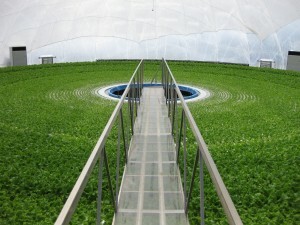 A Granpa Dome uses the latest in computerized horticulture technologies within a closed environment to produce crops. It is a self-contained, circular environment under an inflated fluororesin dome which is both light and durable. 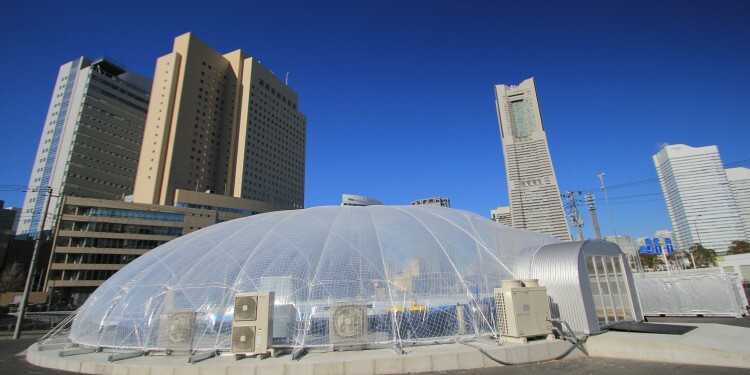 As Japan is a country prone to frequent typhoons, the dome can withstand 45 meters per second winds (100 miles per hour) and hold under 45 cm (17.7 inches) of snow. As designed, the Granpa Dome produces upright foliage plants such as numerous types of lettuce and celery. Seeds are germinated off site in a sterile environment. Seedlings are then transferred to the dome and nurtured in seed beds at the dome’s perimeter. Two weeks later, workers transfer these into a rich nutrient solution at the centre of the dome’s 20 metre circular tank via a maintenance bridge. Steadily spiralling outward toward the perimeter as they grow, up to 15,000 plants are ready to harvest and ship directly to clients in 60 rotations—about 30 days. Because the dome is hermetically sealed by a double-door entry box and natural predators such as wasps control any harmful bugs which might find their way inside, generally, no pesticides are used on the plants. The product can go from the tank to the table without washing. However, if needed, the maintenance bridge crossing the nutrient pool can support the option of a spray mechanism. The dome’s design reduces the shadows created by support pillars in regular greenhouse operations. As a result, all plants develop equally. Also, as they move to the perimeter of the nutrient tank, the space required to grow increases. This saves the labour-intensive step of transplanting and reduces wasted growing space common in conventional greenhouses. Also, fewer workers are needed to maintain the operation and package produce. Heavy labour common to field operations is eliminated. Using data gathered by an external sensor pole, a Granpa Dome utilizes both natural and artificial light. This light is also reflected. That significantly reduces the energy requirements compared to other conventional rectangular systems or LED factory models. All external climatic variables which can impact crop production internally (external wind speed, humidity, temperature and radiation) are read by the sensor pole and are controlled by the dome’s computer system. This can be operated manually or automatically. In addition, it can be constantly monitored as well as adjusted remotely. At the same time, a data log enables the analysis of the entire process in order for the operator to modify future production and marketing strategies. Historically, Granpa Dome is part of a third generation of plant factories in Japan which began under Hitachi’s Central Research Laboratory in 1974. The dome system has numerous advantages. First, crops are not exposed to weather and pests or the numerous microorganisms, viruses and bacteria which negatively impact harvests in nature. Second, continuous cropping has no negative impact on a Granpa Dome plant factory. Third, the clean nutrient solution (the terroir, if you will) can be enriched to improve taste and requires less water than an open field. In addition, a Granpa Dome can be incorporated into city spaces with ease. Large tracts of land are not necessary. Finally, as regular testing for radiation is also part of the Granpa Dome system’s capabilities, consumers can be assured that the produce received is safe. After the Great East Japan Earthquake and Tsunami of 2011 destroyed much of the farmland in the Tohoku region and radiation contaminated some areas, Granpa Dome set up two factories in Iwate and Fukushima prefectures to create employment and re-establish food production. Now there are twelve Granpa Domes working to speed recovery throughout the affected region. 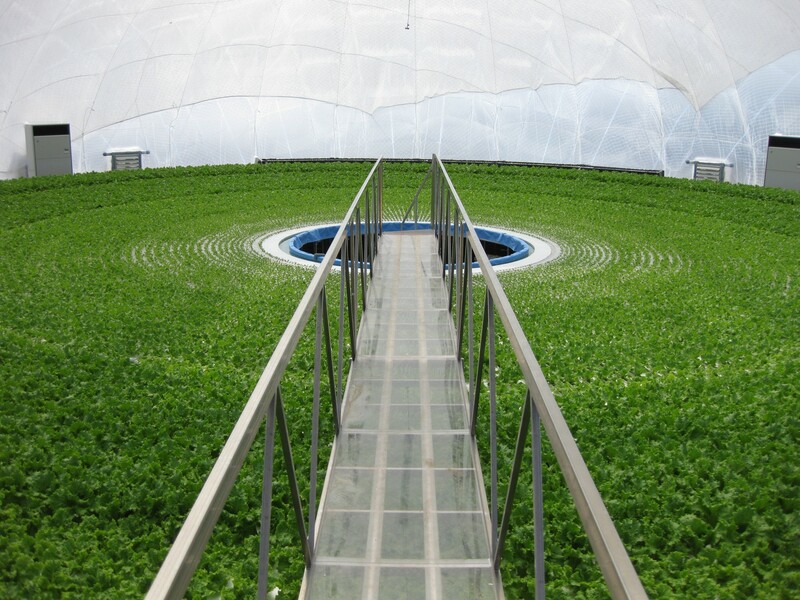 Although start-up costs of the dome system are significant, lettuce is a popular and profitable crop in Japan. As acquisition of the business and agricultural knowledge necessary to operate a dome farm can be acquired in 50 days, the system is attractive to potential entrepreneurs. Then, after operational training, Granpa Dome offers ongoing support services. Abe hopes that the factory system will attract young business people who may be more comfortable with controlling a farm operation from their computers or cell phones than working fields. 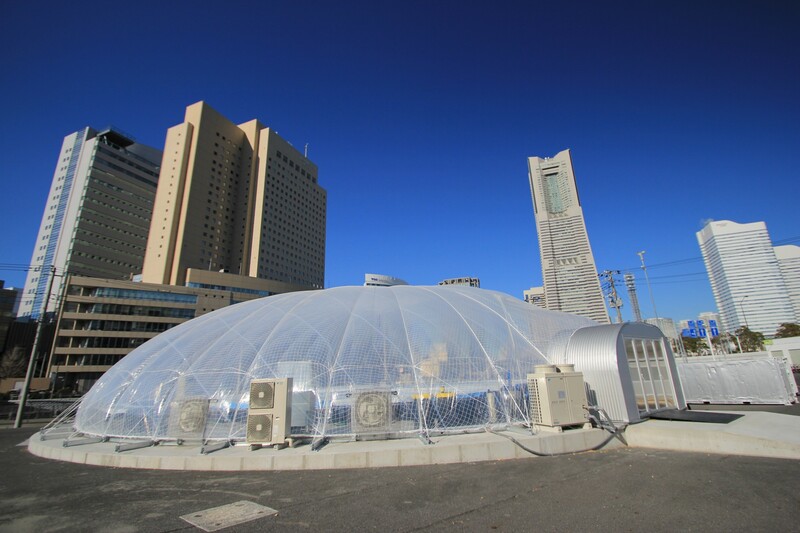 Establishing its unique dome farms in Japan is only part of the company’s commitment to creating agriculture in eco-friendly urban environments. 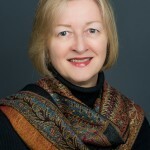 An additional company goal is to become an exporter of its system to international markets. Though a non-disclosure agreement prohibits the publication of the details, Granpa Dome is presently in the process of realizing that ambition. Inquiries may be directed to Granpa Co via their website www.granpa.co.jp/index.html where an English pdf file is available. 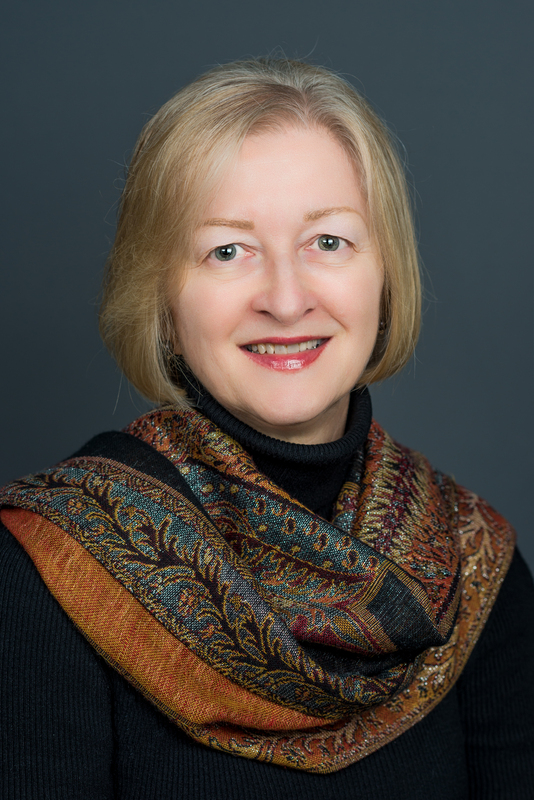 However, knowledge of Japanese business culture and familiarity with channels of international communication are recommended for anyone seriously interested in establishing a dome farm in Canada. DON”T MISS ANOTHER ISSUE OF MODERN AGRICULTURE! Delivered to your door 4 times a year. SUBSCRIBE TODAY!